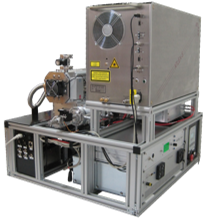 The LAAPTOF has been developed to chemically and physically analyze single aerosol particles by the means of time of flight mass spectrometry. The instrument is composed of three regions: the inlet system, the particle time of flight (PTOF) region and the ablation/mass spectrometer region. Together, these regions constitute a differentially pumped vacuum system, which pressure decreases towards the mass spectrometer. On the one hand this is important to provide the vacuum needed by the mass spectrometer and on the other hand it separates the particles from their carrying gas, which greatly improves the signal to noise ratio. The inlet system is composed of a critical orifice followed by an aerodynamic particle lens. The critical orifice reduces the flow to approximately 100 ml/min ensuring optimal pressure and flow conditions to operate the aerodynamic lens. The aerodynamic lens constitutes a series of orifices, which are designed to focus the aerosol particles on a narrow beam, while defocusing the molecules of the carrier gas. The last orifice of the aerodynamic lens is operated with a critical pressure drop. This results in a supersonic expansion of the aerosol, accelerating the particles into the vacuum of the PTOF region and the mass spectrometer. The particles are accelerated to different velocities according to their vacuum aerodynamic diameter. In the second region, the particle velocity is determined from the time of flight between two light scattering stages. The signal of the second light scattering stage is used to trigger the ablation/ionization laser. After calibration with size standards, the PTOF is converted into diameters. 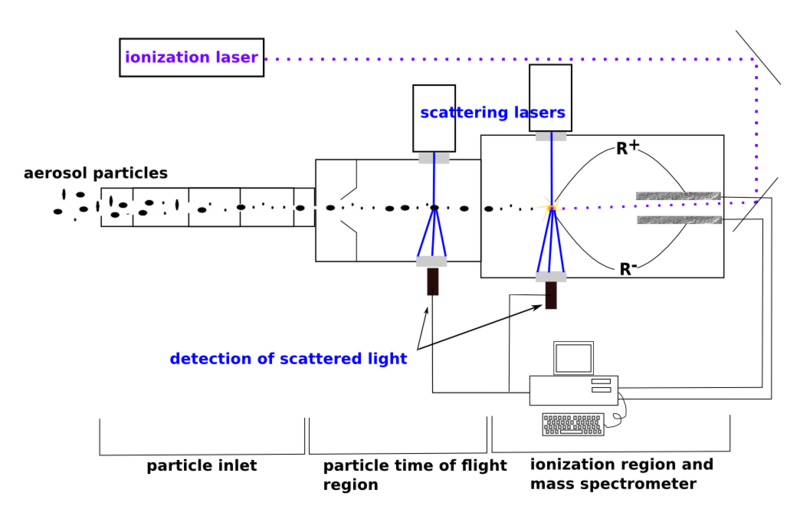 The third region is the time of flight mass spectrometer (TOF). In this region the particles are evaporated and ionized using LDI (laser desorption ionization) by a pulsed UV laser. The laser pulse causes extreme thermal stress on the particles, which are evaporated and ionized at the same time. The positive as well as the negative ions are analyzed in a bipolar time of flight mass spectrometer. Since the particles do not impact on a surface prior to their analysis, artifacts from particle surface interaction are avoided.